How to create a voice over? This tutorial is designed to guide you through the process of making voice-overs for numerous purposes of both entertainment and business. Turn on your microphone and be sure it's working fine. 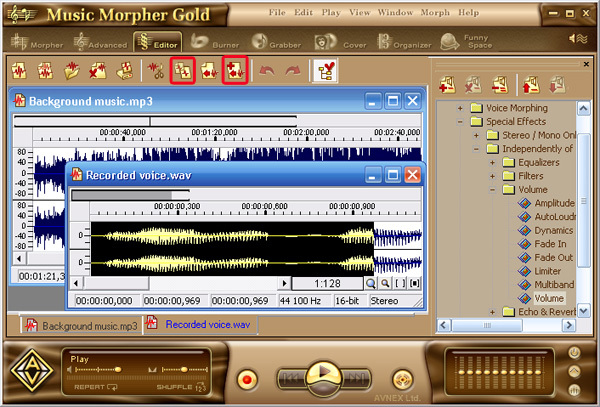 Open AV Music Morpher and click the Record button on the player panel. The Record dialog will come up. • Press the red button, speak to the microphone and start recording your voice. Press this button again when you want to stop the process. • Use the Play and Stop buttons to play back your recording. If you are satisfied with the result, click Save. 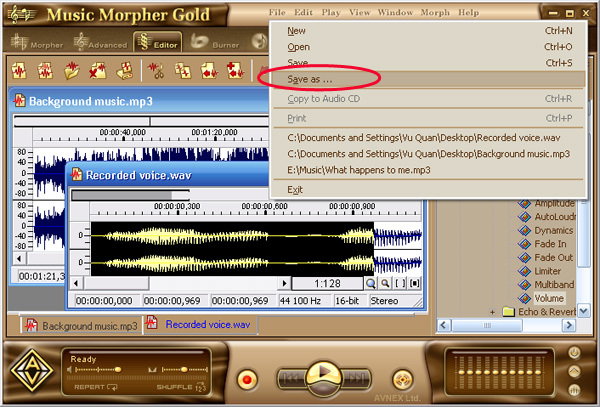 The Save As dialog will appear, choose a desired file name and audio format. If you are not satisfied with the result, record again. • Choose an enjoyable piece of music to be the audio theme. • Click the Editor tab on AV Music Morpher. The Editor module now comes up. • Click Open File on the toolbar to import the music file into AV Wave Editor. • Drag and drop (or press Ctrl+A) to select the whole file. Press the Play button on the player panel to listen to the music. • Double click on Effect Library on the right of the window, then Special Effects > Independently of Channel Quality > Volume. Choose the Volume effect. 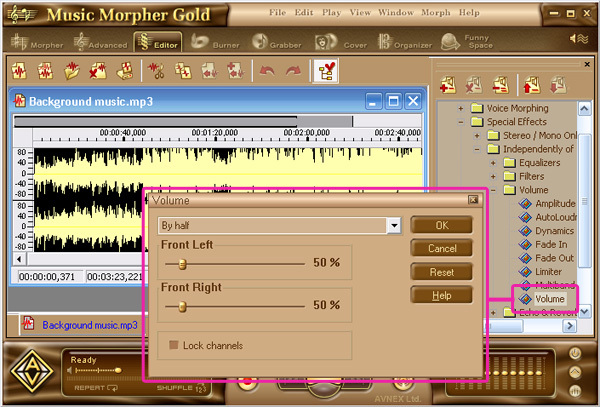 • Move the slider to the left and reduce the volume of the background music to a desired level. For more convenience, you may also use the preset settings. Then press OK.
• Click the Play button on the player panel and listen to the result. Remember to choose None in the Effect Library so that your file won't be modified twice. • Click Open File on the toolbar to import the voice file into AV Wave Editor. • Drag and drop (or press Ctrl+A) to select the whole file. • Press Copy on the toolbar (or Ctrl+C). • Back to the Background music file and press Paste Mix on the toolbar. Notice the time line for a more precise paste-mix. The voice is now mixed into the music. Click the Play button on the player panel and listen to your work. Once satisfied with the result, click File on the menu bar and choose Save as to save your work. If you are not contented, click Undo on the toolbar and perform the mixing again until getting the desired result. Note: You may edit both music and voice with available editing tools, such as Copy, Cut, Paste, or apply more effects to improve the audio quality and make the file more fascinating.